Brighten up your garden with this beautiful set of three frost effect solar cornet lights. Charging by day, they have a light sensor that automatically switches them on at dusk and off again at dawn, adding atmosphere and ambiance to any garden. 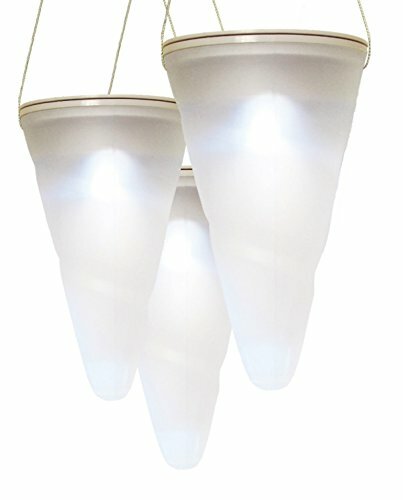 Opaque cone lens, designed to hang from tree limbs and branches. Charges in the day from a solar cell on the top of the Cornet, the lamp automatically turns on at dusk to illuminate branches and foliage. Each Cornet is powered by a top-mounted solar panel, charging circuit and rechargeable 600mAh NiMH battery (included).